During the last two years we have highly appreciated the qualities of Alan Richmond. He is thoroughly professional, conscientious and efficient. He works very well either independently or wifh other team members. He has a clear ability to apply innovative techniques and he has demonstrated a high level of competence in software design, development and documentation. Each time he was starting a new application he sought without any guidance, to generalize and to standardize, taking into account our global environment. This resulted in methods and tools for all the software developers. 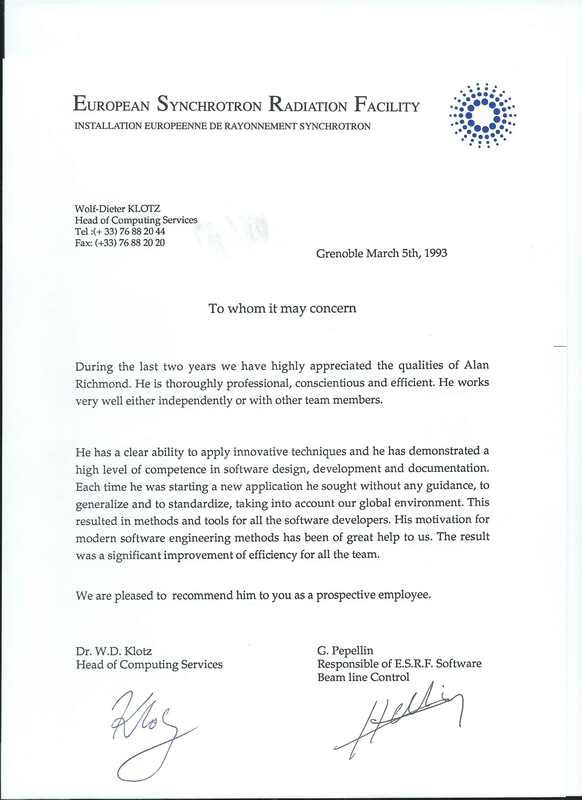 His motivation for modern software engineering methods has been of great help to us. The result was a significant improvement of efficiency for all the team, We are pleased to recommend him to you as a prospective employee.